States are very interested in using social media – particularly websites – to communicate the CTE brand. Websites are a very visible form of communication, and they are also relatively inexpensive as a form of marketing. Branding your state CTE website will help spread the message of CTE and unify you with the national look and feel of CTE. A number of states are using the CTE logo on the websites, but New Jersey has gone beyond just using the logo. They are also using the branding resources, messaging and color scheme to create a consistent look and feel. 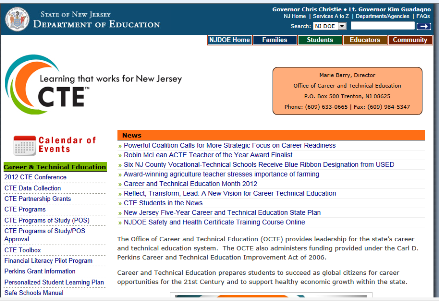 New Jersey’s Office of Career and Technical Education has included the CTE brand on its website and its three main sections are displayed in the three colors of the CTE logo. The site also prominently displays the CTE logo and the CTE: Learning that works for America video. If your state is planning to use the new CTE: Learning that works for America brand on your website, think about a well-rounded approach. Be sure to use not only the logo, but also the brand color scheme and the brand messaging to communicate the brand promise.